In a Victorian-first trial, a 200m-long concrete footpath made with 199,000 recycled glass and plastic bottles has been laid in Hoppers Crossing this month. Sustainability Victoria partnered with Swinburne University of Technology to develop the new method of pavement construction, with funding from the Victorian government’s Research, Development and Demonstration grant. 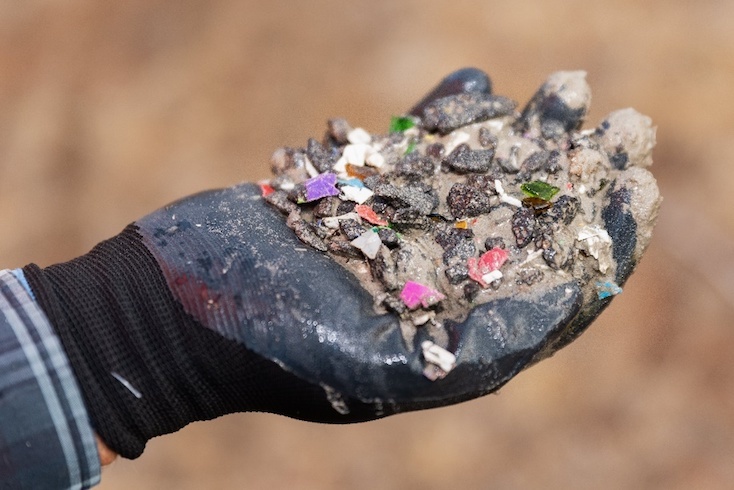 This is part of the $4.5 million Resource Recovery Market Development Program to increase the use of recovered glass fines and flexible plastics in new or existing products or processing approaches. The aggregate contains shredded recycled plastics between 4-8mm, and glass fines – leftover glass particles typically between 3-8mm in size. Glass fines are too small to be recycled during the normal recycling process and would otherwise be stockpiled or sent to landfill. The glass fines and plastic are bound directly into the concrete using a similar technique to traditional aggregate materials. Importantly, the aggregate blend meets the required strength and standard requirements for footpath construction, with testing showing similar wear resistance to control samples. The real-world application in Hoppers Crossing follows a laboratory development and testing stage. It will be closely monitored to confirm durability and performance including if, or how, any plastics could potentially be released from the solid bound pavement. Information from this demonstration project will be captured and used to inform any future improvements to the product. “By driving the development of innovative new products and materials made of recycled content like this, and by encouraging the government and local government to buy them, we are building a better waste system here in Victoria,” said Stan Krpan, Sustainability Victoria CEO. “A system that diverts materials from landfill, consumes fewer natural resources and reduces carbon emissions.